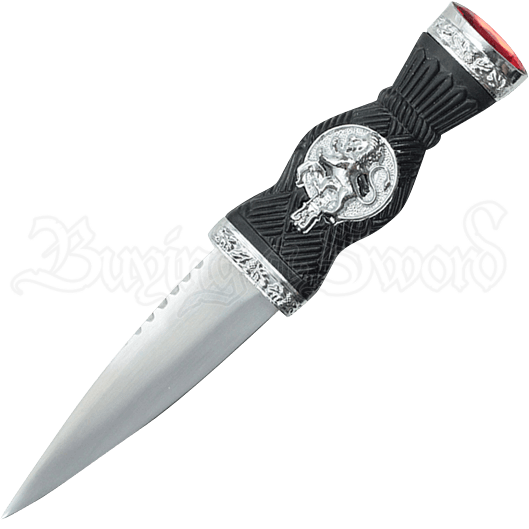 Emblazoned with a rampant lion like the one seen on the Royal Banner of Scotland, the Red Gem Lion Sgian Dubh makes a stunning display of Highlander heritage. A red gemstone sits in the flat pommel of this traditional Scottish dagger. Made of stainless steel, the spear point blade of this historical replica dirk has slight serrations along its back and up next to the hilt, lending detail and versatility. Textured with lines and grooves to help create a firm grip, the hard black composite hilt is bordered by silvery bands detailed with an ornate thistle pattern. This silver tone matches that of the round lion medallion, which appears at the center of the grip. The bottom band of silver artfully surrounds the oval shaped gemstone of the pommel. With its matching black composite sheath included, this historical Scottish knife makes an excellent addition to Highlander themed reenactment outfits. Artfully designed and full of Scottish imagery, this gemstone dagger also makes a great addition to weapons collections and displays.